It used to be that the barbershop wasn’t just a place to get a haircut or shave; it was the hub of the community- where people came together to bond, socialize and exchange ideas. With the goal of bringing this camaraderie back in style, Blind Barber, a barbershop and cocktail parlor with locations in New York and Los Angeles, has created a concept that goes well beyond cuts, shaves and cocktails. We sat down with one of their Founders, Josh Boyd, to talk Fatherhood, Goodnight Gorilla, Grooming, and all things Hip Daddy. For me, being a dad is something that I have always looked forward to throughout my life. It really is what life is all about and being a dad comes to life at all different times and ages for people. I am turning 40 in a week and my wife Heather and I just had our 2nd baby. His name is Beau and his 2 year old brother is named Desmond. I can’t believe how fast it happens and how incredibly life changing children are. What is it like being a dad? It’s a privilege, the best job in the world. We are kind of developing our parenting style as we go with each child. We have read the books, taken advice from family and friends that have done it before and heard every opinion on styles. Our style is teamwork between Heather and I and when they are babies, it’s just taking care of them to the best of your ability. As they get older I will teach the boys their ninja style through love. my wife. To all the people out there who do it alone (like my mom), you are special. Every Hip Daddy loves a good haircut and a cocktail. Tell us more about Blind Barber and what’s on the horizon for you guys? What does it mean to be a Hip Daddy? 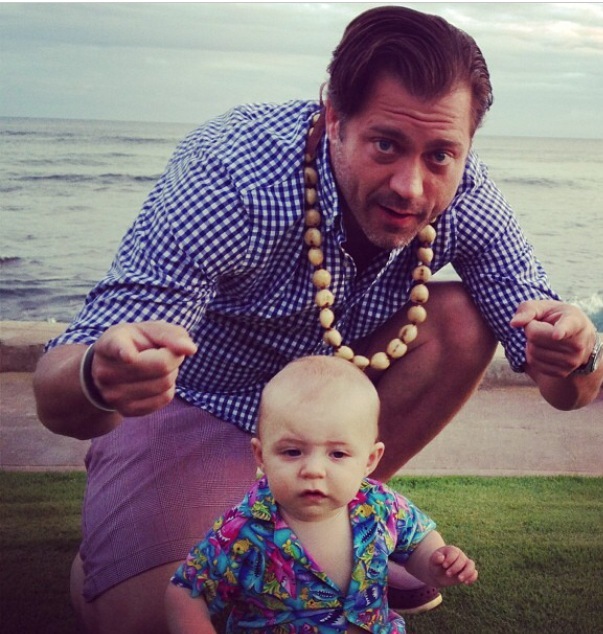 Being a Hip Daddy starts with being there and raising your baby, plain and simple. If you do that, you are crazy hip! I think the more you are around and the more hands-on you can be is the best for you and your babies. It’s getting your hands dirty with the diapers, it’s the late night feeding so your sleep deprived wife can rest, it’s reading countless hours of Goodnight Gorilla, it’s the hugs and the beach runs, it’s cooking meals whenever you can, it’s being responsible and a positive person that your kids can look up to and learn from. I mean, thats not even scratching the surface but you get the idea. If you are down with all this, then you are HIP. For more, follow Blind Barber on Twitter and Josh on Facebook.